In John Sergeant Wise's End of an Era, the glory of modern chivalry, passing into the mists of history, shines out in one man's very elegant prose. Totally authentic, this unabridged memoir constitutes one of the best first-person narratives of the Civil War period. With power and candor, Wise captures the charm of the Old South, the disgrace of slavery, and the horrors of the war. Lives were changed in a moment of time, a new culture arising promising a better future. It is a poignant account of the mixed blessings of duty, honor, patriotism, victory and defeat. 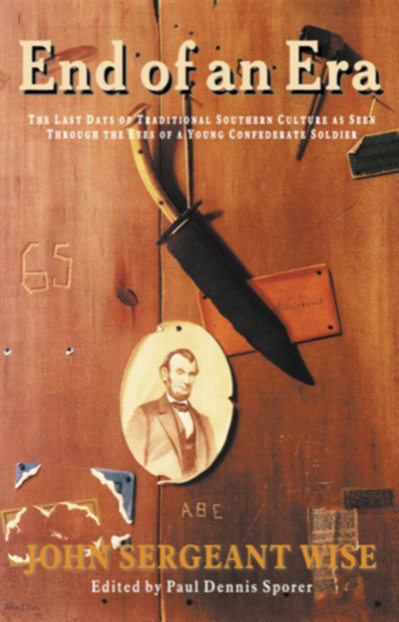 End of an Era reads like a novel, letting us see the world of mid-19th century southern America from the perspective of a young Confederate soldier. It is a valuable archive of sociological and anthropological information about an extinguished society. Wise describes many of the small towns, villages, and territories of early Virginia, recalling the demographic, economic, religious, and political aspects that made them notable. In the book's detailed and precise language, the strands that constituted the fabric of antebellum Southern culture are beautifully portrayed. He also depicts the privations and chaos of war with unflinching honesty. Wise does not glorify the Southern army or its government, nor does he try to justify his occasionally ungentlemanly conduct and speech. The full range of his emotions is exhibited in this memoir, reactions he had to the complex changes that occurred within his own circle, as well as in larger society. End of an Era is an unforgettable experience, where a culture long vanished is brought back to life. Available Now! To order this book, click here for the hardcover, click here for the softcover.